For reals, this vegetarian stew is so comforting, smooth, and velvety it will satisfy even the most ardent red meat-eater. Meaty creminis are browned then added to a flavorful tomato and wine gravy along with pearl onions. The stew is thickened with beurre manié (usually a butter and flour mixture but I used arrowroot powder to speed up the process), and it's ready to serve. This is a truly awesome recipe. 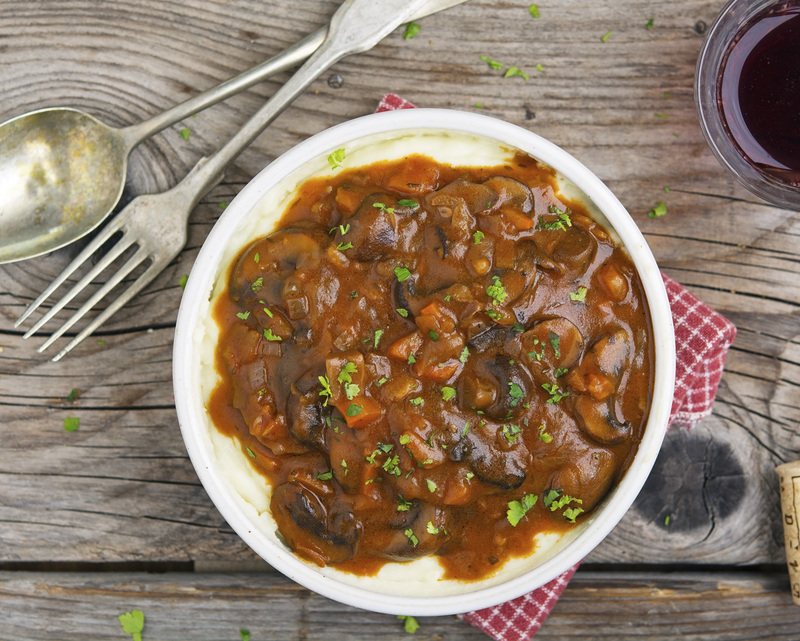 Not only is it a fast alternative to beef stew, but it is also a wonderful mushroom dish in its own right. You can definitely mix in a few different kinds of mushrooms (blue oyster and shiitake are some of my favorites) along with the creminis for funkier flavor. This is a recipe that will transform all your doubts about a vegetarian meal (you know, like the ones I had). 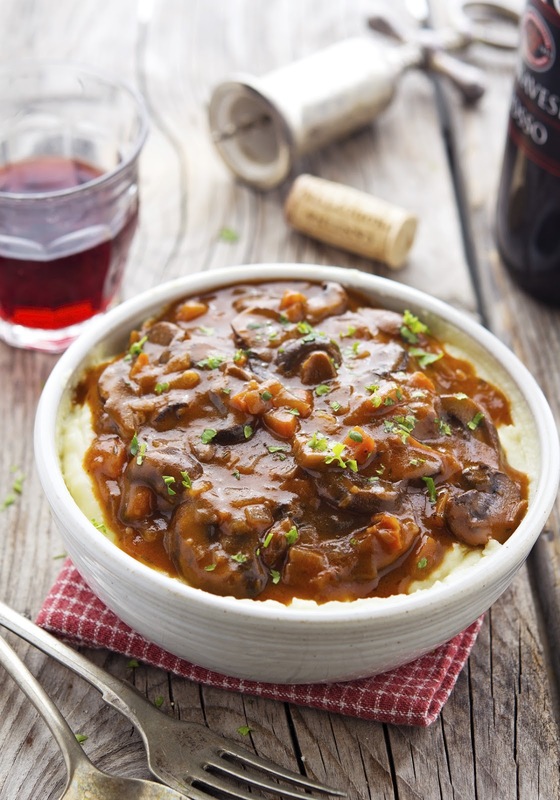 If you love mushrooms and cooking with red wine, this is the dish for you. And by the way I’m not here to tell you that you should forgo meat — you can still totally have that juicy burger or that slab of ribs; but maybe this recipe may change your opinion about vegetarian fare, forever. 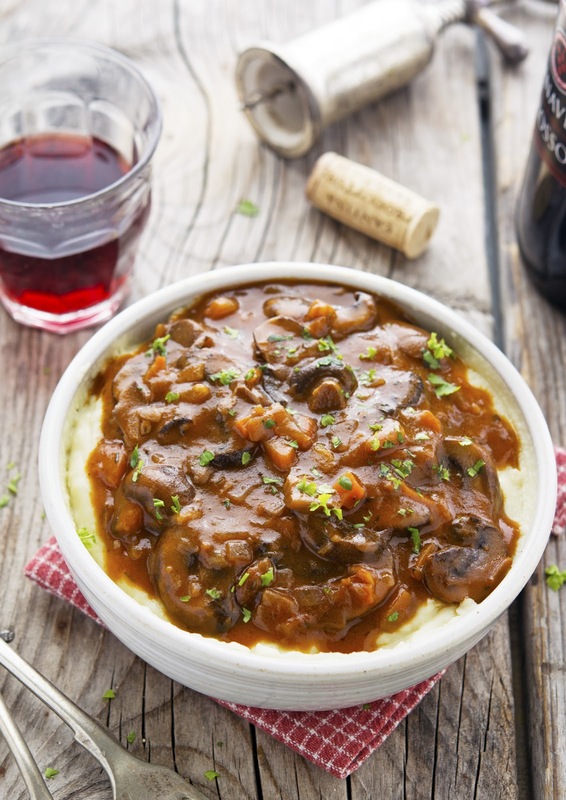 Mushroom Bourguignon Print this recipe! Heat one tablespoon of olive oil and one tablespoon of butter in a heavy-bottomed saucepan over high heat. Add the mushrooms and sear until they begin to darken but do not release any liquid, about 3 minutes. Wipe the saucepan clean and return to the heat. Lower the flame to medium and add one tablespoon of olive oil. Add carrots, chopped onion, thyme and a few pinches of salt. Cook for 10 minutes, stirring every now and then, until the onions are lightly browned. Add garlic and cook for one more minute. Add the wine, turn the heat all the way up and reduce by half - scraping any stuck bits off the bottom. Stir in tomato paste and vegetable broth. Add back the mushrooms along with their liquid and simmer 20 minutes. In the meantime, in a medium skillet heat the remaining tablespoon of olive oil over high heat. Add pearl onions and sear on both sides about 6 to 8 minutes. You want the pearl onions to brown. Add seared pearl onions to the stew and simmer for 5 more minutes. In a small bowl combine the remaining tablespoon of butter with arrowroot (or cornstarch) with a fork. Stir it into the stew. Lower the heat and simmer for 3 minutes or until it reaches the right consistency. Serve over mashed cauliflower, mashed potatoes, or your favorite noodles. One serving yields 244 calories, 13 grams of fat, 17 grams of carbs, and 8 grams of protein. This is one of the first recipes I made from the SK cookbook because: Mushrooms! I secretly like the fact that no one else but me loves the meaty mushroom in my house ;) Super excited that I have all the ingredients for this too. Comparing both recipes I see that one of your main differences is searing the pearl onions separately, then adding them to the stew. Do you find that made a major difference in flavor? This is perfect as I have all the ingredients on hand! YES!! This dish is most definitely for me, I love the flavor of crimini mushrooms paired with red wine and this seems like the perfect cozy weekend recipe! Duuude - you have a misprint - a misspelling - for the first time ever! You wrote "This is a truly awesome recipe." when it should have been "This is a truly awesMAZING recipe." Hope your weekend is awesmazing too my friend! Seriously...for a moment I was like, did he cook beef bourguigon..Goodness it just looked like it. The best..I completely agree with you, vegetarian food can be crazy flavorful and I love my veggie food. This is super good looking, you did great here. This looks so good! Will definitely be giving it a try tomorrow night for a cosy Sunday meal. For having no meat in this it still has me salivating. Pinned to try later this week. Thanks Mike. This looked like it was spooned over polenta, and I got excited. When I realized it wasn't polenta, I got sad. ...but then I realized why the heck couldn't I put this over polenta? This is delicious, I know - I make something quite similar and we love it every time. We like to eat it with spätzle or German bread dumplings (knödel). So good! YES! My husband (a vegetarian) will love this. He is a shroom fanatic too.